In this keynote, Srikanth explains the new recipe for problem-solving at scale with AI. For centuries, the decisions made in a company were the responsibility of the top managers. But when firms harness AI and big data, algorithms can make many more decisions in the same time, and probably better ones. Kenneth Cukier explores how this affects the ways that companies are organized and how they compete and set strategy (as opposed to just execution) as he outlines what is happening now and what to expect in the future. Today, enterprises are putting AI to work on their toughest challenges. Every problem today is an AI problem. It is becoming more and more relevant and ubiquitous. Though AI is a necessary component of all solutions and problem solving, but it is not a sufficient component. Large businesses have large problems which are at worldwide complexity and at a scale of millions of consumers. AI is powered to solve these problems better and deliver higher value. But AI alone is not enough to build a pipeline that drives decisions in real time and solve these problems by making humans behave the way we want them to behave. At ai.lcy we discussed the new recipe to solve business problems and exploit new opportunities at scale. Abhijit is bringing machine intelligence to life at the Lloyds Banking Group. He is accountable for achieving business goals tied to the Machine Intelligence Program as part of the Group’s £3bn strategic transformation agenda. He is also setting up an Academy to democratise AI skills across 75,000+ employees of the Group. He sits on the Expert Advisory Panel of the All Party Parliamentary Committee on Artificial Intelligence in the UK. Earlier, at McKinsey & Company, Abhijit engaged with leaders from large enterprises across Europe, Asia, and North America to help them take strategic and investment decisions, build new digital business models, and drive above-market growth. Previously, at HCL Technologies, Abhijit built and led tech-enabled businesses in Europe and Asia. Ben is head of European delivery for the Visa Data Science Lab, with a professional data history of over 20 years; including data architecture, business intelligence, and data sciences. Whilst enjoying mathematical patterns, Ben also has a particular passion for finding a story in data and for creative methods of visualisation. Online marketing expert with a computer engineering background and a MSc from Stanford University. Eleonora leads Engagement for B2B Marketing in Google EMEA. She drives customer engagement through online channels across >30 countries. She specializes in using advanced analytics and machine learning solutions to solve marketing challenges through better insights, messaging, prediction and automation. Linden Glen is the Digital Transformation Director of Analytics & Data at Mars, where the team he has built defines & runs the global analytics & data platforms, drives the self-service program and spans both Advanced Analytics and BI/Scale Up delivery. In this role, Linden is driving a user centric transformation, focusing on the new & old problems to be solved along with the Product Owner and using Data & Analytics to solve at speed. Critical to the transformation's success has been the introduction of enterprise scale technologies, building a new team of Data Scientists, Business Translators, Engineers & strategic partnerships and importantly embedding new methods & mindsets across the business and IT such as Agile, Design Thinking and DevOps. With an "open" mindset, architecture and operating model Mars is successfully federating the creation of analytics products beyond the center, solving problems close to the users, customers and consumers. Linden is currently based in the UK, previously having lived and worked in China and Australia over his 17 years with Mars. Leads US-consulting for Financial Services and Media-Telecom and Digital. Focused on solution development, client management and helping client gain maximum benefit from the engagement with Fractal. Arpan received his MBA from the Indian Institute of Management, Lucknow, and Bachelor of Science degree from the Indian Institute of Technology, Madras. Natwar has been part of the leadership team of Fractal for more than a decade now. Over these years, he has been instrumental in building our CPG practice & consulting with several Fortune 500 companies across industries. During these years, he has built Fractal Sciences, our data science & technology lab of Fractal that led to various products like Concordia, Trial Run, Customer Genomics. Natwar is now building Cuddle.ai, an AI business incubated within Fractal Analytics. With Cuddle.ai, we aspire to tell you What you need to know at work before you ask – bringing the power of AI to the world of BI. Lead Fractal in powering every human decision in the enterprise through data and analytics. Fractal has been featured as a leader in the Customer Analytics Service Providers Wave™ 2017 by Forrester Research, a Great Place to Work by The Economic Times in partnership with the Great Place to Work® Institute, and recognized as a ‘Cool Vendor’ and a ‘Vendor to Watch’ by Gartner. Leads Algorithmic Decision Making at Fractal. Structured derivatives, FX, Interest trading, Market and Credit Risk at HDFC Bank, Barclays India. Leading Fractal’s Strategy & Transformation. Drive strategic investments and inorganic growth, lead high-priority growth initiatives and help clients on AI led transformation of their businesses. Sameer is a seasoned analytics & AI evangelist for Fortune 500 global companies and has won multiple awards as a top business leader in the analytics industry. Prior to Fractal, Sameer held leadership positions at Cognizant Technology Solutions as Global Business Leader for Analytics & Data Sciences, Fidelity National Financial as Country Head, and Genpact as Vice President - Analytics. In his role at Cognizant, Sameer built and scaled Cognizant’s analytics & data sciences business to be a leading market player in the industry. Applying the sophistication in algorithms to accelerate digital revolution and accentuate decision making across enterprises. Srikanth is passionate about helping Fortune 500 companies leverage AI together with the power of behavioural sciences to make better decisions. 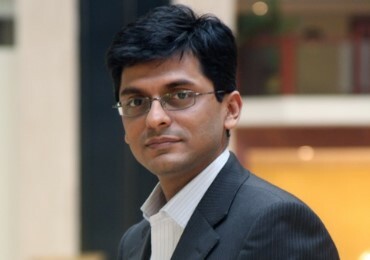 Srikanth is a recognised thought leader in the AI space and heads NASSCOM's AI & Data Sciences Council. He has also served on Government of India appointed AI initiatives. A former investment banker, he co-founded Fractal 19 years ago. Srikanth considers himself a lifelong student of mathematics, behavioural economics, neuroscience and consumer behaviour. Last year, we hosted our first artificial intelligence conference, ai.now, at One WTC New York. This collaborative event inspired great insights from Fortune 500 attendees and featured speakers from companies including Mars, Visa, RB and P&G. We explored how businesses can better leverage AI and shared practical techniques to maximize the value of AI investments, technology and implementations. Martin Ford, New York Times bestselling author, spoke about how AI is outpacing humans and shared a realistic view on the future of work. The event was covered by The Wall Street Journal and also featured in an IDC report by analyst Allison Close.